The schedule for completing the program is flexible and designed to be adapted to the busy lifestyles of working professionals. Working Professional MBA students may enroll in as few as 1.5 credit hours per semester or as many as nine credit hours per semester to lengthen or shorten overall time in the program. Students can attend classes during weekday evenings or on the weekend. The evening and weekend options provide flexibility to fit any schedule. Typically students take approx. 2.5 years to complete the part-time MBA program. MBA core courses at Fisher College of Business provide in-depth exploration of the functional areas that are critical to a complete understanding of the business environment. To complete your degree, students can choose from a wide variety of elective courses; in fact, up to eight credit hours of any graduate course offered by The Ohio State University can be taken, if related to your course of study. Students will need to complete 27 credit hours of core classes, and 21 credit hours of elective courses. There are currently 354 enrolled students in the OSU part-time MBA program; 83 of which are in their first year. About 67 percent of the cohort is male, with 33 percent female students. The average student is 31-years old, earned a 643 GMAT score (600-680 80th percentile range), and enrolled with a 3.43 GPA. Current part-time MBAs in the program have 7.1 years of previous professional work experience. 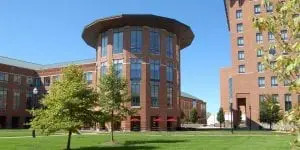 The cost for the part-time MBA at Ohio State’s Fisher College of Business is broken down by credit hours, which can be found in more detail here. The total cost per credit for the part-time MBA is $1,698.30 for Ohio residents and $2,947.80 for out-of-state residents. Over the course of the 48 credits needed to complete the program, this total comes to $81,518 for in-state students and $141,494 for out-of-state residents. There are currently no scholarships available for part-time MBA students at OSU. • Test Scores: GMAT or GRE (waiver available for all candidates that have a 3.2 GPA / B or better in two college-level quantitative courses, and a min of four years of post-baccalaureate work experience. May 15, 2019: Receiving your admissions decision no later than June 1. July 15, 2019: Receive your admissions decision no later than August 1.